This section of the guideline applies regardless of the date of the offence to all children or young people where the first hearing is on or after 1 June 2017. It applies equally in youth courts, magistrates’ courts and the Crown Court. 1.2 While the seriousness of the offence will be the starting point, the approach to sentencing should be individualistic and focused on the child or young person, as opposed to offence focused. For a child or young person the sentence should focus on rehabilitation where possible. A court should also consider the effect the sentence is likely to have on the child or young person (both positive and negative) as well as any underlying factors contributing to the offending behaviour. 1.3 Domestic and international laws dictate that a custodial sentence should always be a measure of last resort for children and young people and statute provides that a custodial sentence may only be imposed when the offence is so serious that no other sanction is appropriate (see section six for more information on custodial sentences). 1.4 It is important to avoid “criminalising” children and young people unnecessarily; the primary purpose of the youth justice system is to encourage children and young people to take responsibility for their own actions and promote re-integration into society rather than to punish. Restorative justice disposals may be of particular value for children and young people as they can encourage them to take responsibility for their actions and understand the impact their offence may have had on others. 1.5 It is important to bear in mind any factors that may diminish the culpability of a child or young person. Children and young people are not fully developed and they have not attained full maturity. As such, this can impact on their decision making and risk taking behaviour. It is important to consider the extent to which the child or young person has been acting impulsively and whether their conduct has been affected by inexperience, emotional volatility or negative influences. They may not fully appreciate the effect their actions can have on other people and may not be capable of fully understanding the distress and pain they cause to the victims of their crimes. Children and young people are also likely to be susceptible to peer pressure and other external influences and changes taking place during adolescence can lead to experimentation, resulting in criminal behaviour. When considering a child or young person’s age their emotional and developmental age is of at least equal importance to their chronological age (if not greater). 1.6 For these reasons, children and young people are likely to benefit from being given an opportunity to address their behaviour and may be receptive to changing their conduct. They should, if possible, be given the opportunity to learn from their mistakes without undue penalisation or stigma, especially as a court sanction might have a significant effect on the prospects and opportunities of the child or young person and hinder their re-integration into society. 1.7 Offending by a child or young person is often a phase which passes fairly rapidly and so the sentence should not result in the alienation of the child or young person from society if that can be avoided. 1.8 The impact of punishment is likely to be felt more heavily by a child or young person in comparison to an adult as any sentence will seem longer due to their young age. In addition penal interventions may interfere with a child or young person’s education and this should be considered by a court at sentencing. 1.10 Section 142 of the Criminal Justice Act 2003 sets out the purposes of sentencing for offenders who are over 18 on the date of conviction. That Act was amended in 2008 to add section 142A which sets out the purposes of sentencing for children and young people, subject to a commencement order being made. The difference between the purposes of sentencing for those under and over 18 is that section 142A does not include as a purpose of sentencing ‘the reduction of crime (including its reduction by deterrence)’. Section 142A has not been brought into effect. Unless and until that happens, deterrence can be a factor in sentencing children and young people although normally it should be restricted to serious offences and can, and often will, be outweighed by considerations of the child or young person’s welfare. For more information on assessing the seriousness of the offence see section four. 1.11 The statutory obligation to have regard to the welfare of a child or young person includes the obligation to secure proper provision for education and training,5 to remove the child or young person from undesirable surroundings where appropriate6 and the need to choose the best option for the child or young person taking account of the circumstances of the offence. the effect on children and young people of experiences of loss and neglect and/or abuse. 1.13 Factors regularly present in the background of children and young people that come before the court include deprived homes, poor parental employment records, low educational attainment, early experience of offending by other family members, experience of abuse and/or neglect, negative influences from peer associates and the misuse of drugs and/or alcohol. 1.14 The court should always seek to ensure that it has access to information about how best to identify and respond to these factors and, where necessary, that a proper assessment has taken place in order to enable the most appropriate sentence to be imposed. 1.15 The court should consider the reasons why, on some occasions, a child or young person may conduct themselves inappropriately in court (e.g. due to nervousness, a lack of understanding of the system, a belief that they will be discriminated against, peer pressure to behave in a certain way because of others present, a lack of maturity etc) and take this into account. 1.16 Evidence shows that looked after children and young people are over-represented in the criminal justice system.7 When dealing with a child or young person who is looked after the court should also bear in mind the additional complex vulnerabilities that are likely to be present in their background. For example, looked after children and young people may have no or little contact with their family and/or friends, they may have special educational needs and/or emotional and behavioural problems, they may be heavily exposed to peers who have committed crime and they are likely to have accessed the care system as a result of abuse, neglect or parental absence due to bereavement, imprisonment or desertion. The court should also bear in mind that the level of parental-type support that a looked after child or young person receives throughout the criminal justice process may vary, and may be limited. For example, while parents are required to attend court hearings, this is not the case for social workers responsible for looked after children and young people. In some instances a looked after child or young person (including those placed in foster homes and independent accommodation, as well as in care homes) may be before the court for a low level offence that the police would not have been involved in, if it had occurred in an ordinary family setting. 1.17 For looked after children and young people who have committed an offence that crosses the custody threshold sentencers will need to consider any impact a custodial sentence may have on their leaving care rights and whether this impact is proportionate to the seriousness of the offence. For other young people who are in the process of leaving care or have recently left care then sentencers should bear in mind any effect this often difficult transition may have had on the young person’s behaviour. 1.18 There is also evidence to suggest that black and minority ethnic children and young people are over-represented in the youth justice system.8 The factors contributing to this are complex. One factor is that a significant proportion of looked after children and young people are from a black and minority ethnic background.9 A further factor may be the experience of such children and young people in terms of discrimination and negative experiences of authority. When having regard to the welfare of the child or young person to be sentenced, the particular factors which arise in the case of black and minority ethnic children and young people need to be taken into account. 1.19 The requirement to have regard to the welfare of a child or young person is subject to the obligation to impose only those restrictions on liberty that are commensurate with the seriousness of the offence; accordingly, a court should not impose greater restrictions because of other factors in the child or young person’s life. 1.20 When considering a child or young person who may be particularly vulnerable, sentencers should consider which available disposal is best able to support the child or young person and which disposals could potentially exacerbate any underlying issues. This is particularly important when considering custodial sentences as there are concerns about the effect on vulnerable children and young people of being in closed conditions, with significant risks of self harm, including suicide. 1.21 The vulnerability factors that are often present in the background of children and young people should also be considered in light of the offending behaviour itself. Although they do not alone cause offending behaviour – there are many children and young people who have experienced these circumstances but do not commit crime – there is a correlation and any response to criminal activity amongst children and young people will need to recognise the presence of such factors in order to be effective. These principles do not undermine the fact that the sentence should reflect the seriousness of the offence. See Determining the sentence for further guidance on assessing the seriousness of an offence. 2.1 Subject to the exceptions noted below, cases involving children and young people should be tried in the youth court. It is the court which is best designed to meet their specific needs. A trial in the Crown Court with the inevitably greater formality and greatly increased number of people involved (including a jury and the public) should be reserved for the most serious cases.10 The welfare principles in this guideline apply to all cases, including those tried or sentenced in the Crown Court. notice has been given to the court (under section 51B or 51C of the Crime and Disorder Act 1998) in a serious or complex fraud or child case. 2.3 A case should be sent to the Crown Court for trial if the offence charged is a specified offence12 and it seems to the court that if found guilty the child or young person would meet the criteria for a sentence under the dangerous offender provisions. a custodial term of at least four years would be imposed for the offence. 2.5 A ‘significant risk’ is more than a mere possibility of occurrence. The assessment of dangerousness should take into account all the available information relating to the circumstances of the offence and may also take into account any information regarding previous patterns of behaviour relating to this offence and any other relevant information relating to the child or young person. In making this assessment it will be essential to obtain a pre-sentence report. 2.7 In anything but the most serious cases it may be impossible for the court to form a view as to whether the child or young person would meet the criteria of the dangerous offender provisions without greater knowledge of the circumstances of the offence and the child or young person. In those circumstances jurisdiction for the case should be retained in the youth court. If, following a guilty plea or a finding of guilt, the dangerousness criteria appear to be met then the child or young person should be committed for sentence. 2.8 Where a child or young person is before the court for an offence to which section 91(1) of the Powers of Criminal Courts (Sentencing) Act 2000 applies and the court considers that it ought to be possible to sentence them to more than two years’ detention if found guilty of the offence, then they should be sent to the Crown Court. The test to be applied by the court is whether there is a real prospect that a sentence in excess of two years’ detention will be imposed. it is one of a number of specified offences in relation to firearms, ammunition and weapons which are subject to a minimum term but, in respect of which, a court has found exceptional circumstances justifying a lesser sentence. 2.10 Before deciding whether to send the case to the Crown Court or retain jurisdiction in the youth court, the court should hear submissions from the prosecution and defence. As there is now a power to commit grave crimes for sentence14 the court should no longer take the prosecution case at its highest when deciding whether to retain jurisdiction.15 In most cases it is likely to be impossible to decide whether there is a real prospect that a sentence in excess of two years’ detention will be imposed without knowing more about the facts of the case and the circumstances of the child or young person. In those circumstances the youth court should retain jurisdiction and commit for sentence if it is of the view, having heard more about the facts and the circumstances of the child or young person, that its powers of sentence are insufficient. Where the court decides that the case is suitable to be dealt with in the youth court it must warn the child or young person that all available sentencing options remain open and, if found guilty, the child or young person may be committed to the Crown Court for sentence. Children and young people should only be sent for trial or committed for sentence to the Crown Court when charged with or found guilty of an offence of such gravity that a custodial sentence substantially exceeding two years is a realistic possibility. For children aged 10 or 11, and children/young people aged 12 – 14 who are not persistent offenders, the court should take into account the normal prohibition on imposing custodial sentences. 2.11 The proper venue for the trial of any child or young person is normally the youth court. Subject to statutory restrictions, that remains the case where a child or young person is jointly charged with an adult. If the adult is sent for trial to the Crown Court, the court should conclude that the child or young person must be tried separately in the youth court unless it is in the interests of justice for the child or young person and the adult to be tried jointly. the lack of previous findings of guilt on the part of the child or young person. 2.13 The court should bear in mind that the youth court now has a general power to commit for sentence (as discussed at paragraph 2.9); in appropriate cases this will permit a sentence to be imposed by the same court on adults and children and young people who have been tried separately. 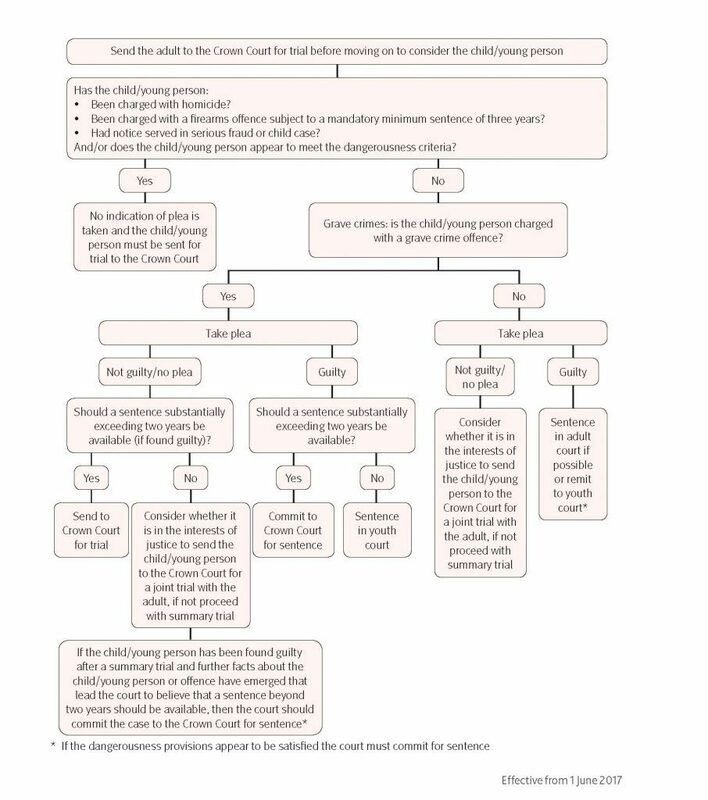 2.14 The court should follow the plea before venue procedure (see flowcharts) prior to considering whether it is in the interests of justice for the child or young person and the adult to be tried jointly. 2.15 If a child or young person is found guilty before the Crown Court of an offence other than homicide the court must remit the case to the youth court, unless it would be undesirable to do so.16 In considering whether remittal is undesirable a court should balance the need for expertise in the sentencing of children and young people with the benefits of the sentence being imposed by the court which determined guilt. 2.16 Particular attention should be given to children and young people who are appearing before the Crown Court only because they have been charged with an adult offender; referral orders are generally not available in the Crown Court but may be the most appropriate sentence. These charts are intended to be a reference tool only; for full guidance, particularly for grave crimes, see Allocation above. 3.1 For any child or young person aged under 16 appearing before court there is a statutory requirement that parents/guardians attend during all stages of proceedings, unless the court is satisfied that this would be unreasonable having regard to the circumstances of the case.17 The court may also enforce this requirement for a young person aged 16 and above if it deems it desirable to do so. 3.2 Although this requirement can cause a delay in the case before the court it is important it is adhered to. If a court does find exception to proceed in the absence of a responsible adult then extra care must be taken to ensure the outcomes are clearly communicated to and understood by the child or young person. 3.3 In addition to this responsibility there are also orders that can be imposed on parents. If the child or young person is aged under 16 then the court has a duty to make a parental bind over or impose a parenting order, if it would be desirable in the interest of preventing the commission of further offences.18 There is a discretionary power to make these orders where the young person is aged 16 or 17. If the court chooses not to impose a parental bind over or parenting order it must state its reasons for not doing so in open court. In most circumstances a parenting order is likely to be more appropriate than a parental bind over. 4.2 The seriousness of the offence is the starting point for determining the appropriate sentence; the sentence imposed and any restriction on liberty must be commensurate with the seriousness of the offence. 4.3 The approach to sentencing children and young people should always be individualistic and the court should always have in mind the principal aims of the youth justice system. 4.4 In order to determine the seriousness of the offence the court should assess the culpability of the child or young person and the harm that was caused, intended to be caused or could foreseeably have been caused. 4.5 In assessing culpability the court will wish to consider the extent to which the offence was planned, the role of the child or young person (if the offence was committed as part of a group), the level of force that was used in the commission of the offence and the awareness that the child or young person had of their actions and its possible consequences. There is an expectation that in general a child or young person will be dealt with less severely than an adult offender. In part, this is because children and young people are unlikely to have the same experience and capacity as an adult to understand the effect of their actions on other people or to appreciate the pain and distress caused and because a child or young person may be less able to resist temptation, especially where peer pressure is exerted. Children and young people are inherently more vulnerable than adults due to their age and the court will need to consider any mental health problems and/or learning disabilities they may have, as well as their emotional and developmental age. Any external factors that may have affected the child or young person’s behaviour should be taken into account. 4.7 The court should also consider any aggravating or mitigating factors that may increase or reduce the overall seriousness of the offence. If any of these factors are included in the definition of the committed offence they should not be taken into account when considering the relative seriousness of the offence before the court. 4.9 With a child or young person, the consideration of age requires a different approach to that which would be adopted in relation to the age of an adult. Even within the category of child or young person the response of a court to an offence is likely to be very different depending on whether the child or young person is at the lower end of the age bracket, in the middle or towards the top end. 4.10 Although chronological age dictates in some instances what sentence can be imposed (see section six for more information) the developmental and emotional age of the child or young person should always be considered and it is of at least equal importance as their chronological age. It is important to consider whether the child or young person has the necessary maturity to appreciate fully the consequences of their conduct, the extent to which the child or young person has been acting on an impulsive basis and whether their conduct has been affected by inexperience, emotional volatility or negative influences. 5.1 The purpose of this section of the guideline is to encourage those who are going to plead guilty to do so as early in the court process as possible. Nothing in this section should be used to put pressure on a child or young person to plead guilty. 5.3 A guilty plea produces greater benefits the earlier the plea is made. In order to maximise the above benefits and to provide an incentive to those who are guilty to indicate a guilty plea as early as possible, this section of the guideline makes a clear distinction between a reduction in the sentence available at the first stage of the proceedings and a reduction in the sentence available at a later stage of the proceedings. 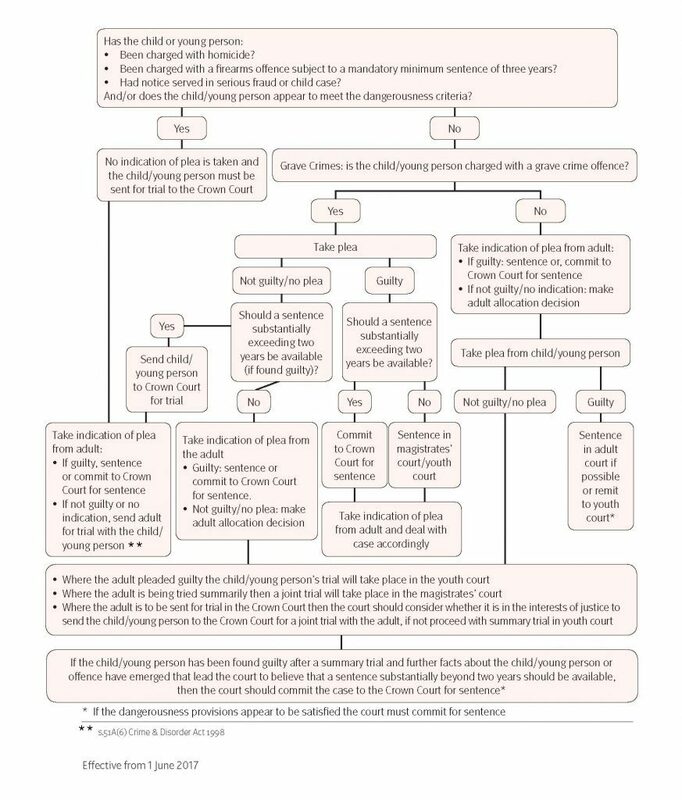 5.4 The purpose of reducing the sentence for a guilty plea is to yield the benefits described above and the guilty plea should be considered by the court to be independent of the child or young person’s mitigation. The benefits apply regardless of the strength of the evidence against a child or young person. The strength of the evidence should not be taken into account when determining the level of reduction. This section applies only to the punitive elements of the sentence and has no impact on ancillary orders including orders of disqualification from driving. Stage 1 Determine the appropriate sentence for the offence(s) in accordance with any offence specific sentencing guideline or using this Overarching Principles guideline. The maximum level of reduction for a guilty plea is one-third. 5.6 Plea indicated after the first stage of proceedings – maximum one quarter – sliding scale of reduction thereafter: After the first stage of the proceedings the maximum level of reduction is one-quarter (subject to the exceptions below). 5.7 The reduction should be decreased from one-quarter to a maximum of one-tenth on the first day of trial having regard to the time when the guilty plea is first indicated relative to the progress of the case and the trial date (subject to the exceptions below). The reduction should normally be decreased further, even to zero, if the guilty plea is entered during the course of the trial. 5.8 For the purposes of this guideline a trial will be deemed to have started when pre-recorded cross-examination has begun. 5.9 A detention and training order (DTO) can only be imposed for the periods prescribed – 4, 6, 8, 10, 12, 18 or 24 months. If the reduction in sentence for a guilty plea results in a sentence that falls between two prescribed periods the court must impose the lesser of those two periods. This may result in a reduction greater than a third, in order that the full reduction is given and a lawful sentence imposed. by reducing a community sentence to a different means of disposal. Alternatively the court could reduce the length or severity of any punitive requirements attached to a community sentence. 5.11 The court must always have regard to the principal aim of the youth justice system, which is to prevent offending by children and young people. It is, therefore, important that the court ensures that any sentence imposed is an effective disposal. 5.12 Where a court has imposed one sentence rather than another to reflect the guilty plea there should normally be no further reduction on account of the guilty plea. Where, however, the less severe type of sentence is justified by other factors, the appropriate reduction for the plea should be applied in the normal way. 5.13 When dealing with more than one summary offence, the aggregate sentence is limited to a maximum of six months. Allowing for a reduction for each guilty plea, consecutive sentences might result in the imposition of the maximum six month sentence. Where this is the case, the court may make a modest additional reduction to the overall sentence to reflect the benefits derived from the guilty plea. 5.14 A DTO of up to 24 months may be imposed on a child or young person if the offence is one which, but for the plea, would have attracted a sentence of detention in excess of 24 months under section 91 of the Powers of Criminal Courts (Sentencing) Act 2000. 5.15 As a referral order is a sentence that is only available upon pleading guilty there should be no further reduction of the sentence to reflect the guilty plea. 5.16 Where the sentencing court is satisfied that there were particular circumstances which significantly reduced the child or young person’s ability to understand what was alleged, or otherwise made it unreasonable to expect the child or young person to indicate a guilty plea sooner than was done, a reduction of one-third should still be made. 5.17 In considering whether this exception applies, sentencers should distinguish between cases in which it is necessary to receive advice and/or have sight of evidence in order to understand whether the child or young person is, in fact and law, guilty of the offence(s) charged, and cases in which a child or young person merely delays guilty plea(s) in order to assess the strength of the prosecution evidence and the prospects of a finding of guilt or acquittal. 5.18 In circumstances where a child or young person’s version of events is rejected at a Newton hearing22 or special reasons hearing,23 the reduction which would have been available at the stage of proceedings the plea was indicated should normally be halved. Where witnesses are called during such a hearing, it may be appropriate further to decrease the reduction. 5.19 If a child or young person is found guilty of a lesser or different offence from that originally charged, and has earlier made an unequivocal indication of a guilty plea to this lesser or different offence to the prosecution and the court, the court should give the level of reduction that is appropriate to the stage in the proceedings at which this indication of plea (to the lesser or different offence) was made taking into account any other of these exceptions that apply. In the Crown Court where the offered plea is a permissible alternative on the indictment as charged, the child or young person will not be treated as having made an unequivocal indication unless the defendant has entered that plea. 5.20 There can be no reduction for a guilty plea if the effect of doing so would be to reduce the length of sentence below the required minimum term. 5.21 In circumstances where an appropriate custodial sentence of a DTO of at least four months falls to be imposed on a young person who is aged at least 16 but under 18, who has been found guilty under sections 1 or 1A of the Prevention of Crime Act 1953; or section 139, 139AA or 139A of the Criminal Justice Act 1988 (certain possession of knives or offensive weapon offences) the court may impose any sentence that it considers appropriate, having taken into consideration the general principles set out above. 5.22 Murder is the most serious criminal offence and the sentence prescribed is different from all other sentences. By law, the sentence for murder is detention for life and the child or young person will remain subject to the sentence for the rest of their life. 5.23 Given the special characteristic of the offence of murder and the unique statutory provision in Schedule 21 of the Criminal Justice Act 2003 of starting points for the minimum term to be served by a child or young person, careful consideration has to be given to the extent of any reduction for a guilty plea and to the need to ensure that the minimum term properly reflects the seriousness of the offence. 5.24 Whilst the general principles continue to apply (both that a guilty plea should be encouraged and that the extent of any reduction should reduce if the indication of plea is later than the first stage of the proceedings) the process of determining the level of reduction will be different. The exceptions outlined at 5.16 – 5.18 apply to murder cases. 6.1 There will be occasions when an increase in the age of a child or young person will result in the maximum sentence on the date of the finding of guilt being greater than that available on the date on which the offence was committed (primarily turning 12, 15 or 18 years old). the making of reparation by offenders to persons affected by their offences. 6.3 When any significant age threshold is passed it will rarely be appropriate that a more severe sentence than the maximum that the court could have imposed at the time the offence was committed should be imposed. However, a sentence at or close to that maximum may be appropriate. a detention and training order (DTO) when aged 12 – 14. 6.5 The term persistent offender is not defined in statute but has been considered by the Court of Appeal. In general it is expected that the child or young person would have had previous contact with authority as a result of criminal behaviour. This includes previous findings of guilt as well as admissions of guilt such as restorative justice disposals and conditional cautions. 6.7 If there have been three findings of guilt in the past 12 months for imprisonable offences of a comparable nature (or the child or young person has been made the subject of orders as detailed above in relation to an imprisonable offence) then the court could certainly justify classing the child or young person as a persistent offender. 6.8 When a child or young person is being sentenced in a single appearance for a series of separate, comparable offences committed over a short space of time then the court could justifiably consider the child or young person to be a persistent offender, despite the fact that there may be no previous findings of guilt.27 In these cases the court should consider whether the child or young person has had prior opportunity to address their offending behaviour before imposing one of the optional sentences available for persistent offenders only; if the court determines that the child or young person has not had an opportunity to address their behaviour and believes that an alternative sentence has a reasonable prospect of preventing re-offending then this alternative sentence should be imposed. 6.9 The court may also wish to consider any evidence of a reduction in the level of offending when taking into account previous offending behaviour. Children and young people may be unlikely to desist from committing crime in a clear cut manner but there may be changes in patterns of criminal behaviour (e.g. committing fewer and/or less serious offences or there being longer lengths of time between offences) that indicate that the child or young person is attempting to desist from crime. 6.10 Even where a child or young person is found to be a persistent offender, a court is not obliged to impose one of the optional sentences. The approach should still be individualistic and all other considerations still apply. Custodial sentences must be a last resort for all children and young people and there is an expectation that they will be particularly rare for children and young people aged 14 or under. * If found guilty of a specified violent or sexual offence and the court is of the opinion that there is a significant risk to the public of serious harm caused by the child or young person committing further specified offences. 6.11 Some sentences have longer rehabilitation periods than others, for example referral orders are spent on the last day on which the order is to have effect.28 Sentences can also have varying impacts on the future of children and young people; for example absolute or conditional discharges are not deemed to be treated as convictions other than for the purposes of criminal proceedings29 and therefore may have a lesser impact on the child or young person’s future prospects than other sentences. The length of the rehabilitation periods and any likely effects on the child or young person’s future prospects should be taken into account when considering if the sentence is commensurate to the seriousness of the offence. 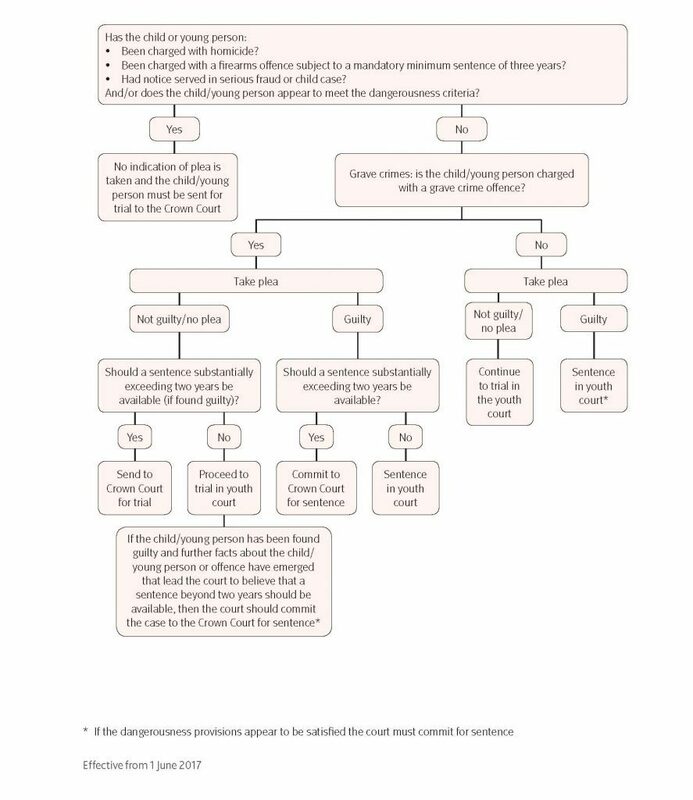 6.12 If a child or young person is found guilty of breaching an order, or commits a further offence during the period of an order, the court will have various options available depending upon the nature of the order (see Appendix one). The primary aim of the court should be to encourage compliance and seek to support the rehabilitation of the child or young person. 6.13 An absolute discharge is appropriate in the least serious cases when, despite a finding of guilt, the court considers that no punishment should be imposed. 6.15 A reparation order can require a child or young person to make reparation to the victim of the offence, where a victim wishes it, or to the community as a whole. Before making an order the court must consider a written report from a relevant authority, e.g. a youth offending team (YOT), and the order must be commensurate with the seriousness of the offence. 6.16 If the court has the power to make a reparation order but chooses not to do so, it must give its reasons. 6.17 The court may impose a fine for any offence (unless the criteria for a mandatory referral order are met). In accordance with statutory requirements, where financial orders are being considered, priority must be given to compensation orders and, when an order for costs is to be made alongside a fine, the amount of the cost must not exceed the amount of the fine. If the child or young person is under 16 then the court has a duty to order parents or guardians to pay the fine; if the young person is 16 or over this duty is discretionary. In practice, many children and young people will have limited financial resources and the court will need to determine whether imposing a fine will be the most effective disposal. 6.18 A court should bear in mind that children and young people may have money that is specifically required for travel costs to school, college or apprenticeships and lunch expenses. 6.19 A referral order is the mandatory sentence in a youth court or magistrates’ court for most children and young people who have committed an offence for the first time and have pleaded guilty to an imprisonable offence. Exceptions are for offences where a sentence is fixed by law or if the court deems a custodial sentence, an absolute or conditional discharge or a hospital order to be more appropriate. the offence is serious enough for a YRO but it is felt that a referral order would be the best way to prevent further offending (as an example, this may be because the child or young person has responded well in the past to such an order and the offence now before the court is dissimilar to that for which a referral order was previously imposed). Referral orders are the main sentence for delivering restorative justice and all panel members are trained Restorative Conference Facilitators; as such they can be an effective sentence in encouraging children and young people to take responsibility for their actions and understand the effect their offence may have had on their victim. 6.21 In cases where children or young people have offended for the first time and have pleaded guilty to committing an offence which is on the cusp of the custody threshold, YOTs should be encouraged to convene a Youth Offender Panel prior to sentence (sometimes referred to as a “pseudo-panel” or “pre-panel”) where the child or young person is asked to attend before a panel and agree an intensive contract. If that contract is placed before the sentencing youth court, the court can then decide whether it is sufficient to move below custody on this occasion. The proposed contract is not something the court can alter in any way; the court will still have to make a decision between referral order and custody but can do so on the basis that if it makes a referral order it can have confidence in what that will entail in the particular case. 6.22 The court determines the length of the order but a Referral Order Panel determines the requirements of the order. The YOT may propose certain requirements and the length of these requirements may not correspond to the above table; if the court feels these requirements will best achieve the aims of the youth justice system then they may still be imposed. 6.23 A YRO is a community sentence within which a court may include one or more requirements designed to provide for punishment, protection of the public, reducing re-offending and reparation. 6.24 When imposing a YRO, the court must fix a period within which the requirements of the order are to be completed; this must not be more than three years from the date on which the order comes into effect. 6.26 The requirements included within the order (and the subsequent restriction on liberty) and the length of the order must be proportionate to the seriousness of the offence and suitable for the child or young person. The court should take care to ensure that the requirements imposed are not too onerous so as to make breach of the order almost inevitable. * These requirements are only available for young people aged 16 or 17 years old on the date of the finding of guilt. ** These requirements can only be imposed if the offence is an imprisonable one AND the custody threshold has been passed. For children and young people aged under 15 they must be deemed a persistent offender. Many of the above requirements have additional restrictions. Magistrates, always consult your legal adviser before imposing a YRO. 6.28 When determining the nature and extent of the requirements the court should primarily consider the likelihood of the child or young person re-offending and the risk of the child or young person causing serious harm. A higher risk of re-offending does not in itself justify a greater restriction on liberty than is warranted by the seriousness of the offence; any requirements should still be commensurate with the seriousness of the offence and regard must still be had for the welfare of the child or young person. 6.29 The YOT will assess this as part of their report and recommend an intervention level to the court for consideration. It is possible for the court to ask the YOT to consider a particular requirement. 6.30 If a child or young person is assessed as presenting a high risk of re-offending or of causing serious harm but the offence that was committed is of relatively low seriousness then the appropriate requirements are likely to be primarily rehabilitative or for the protection of the public. 6.31 Likewise if a child or young person is assessed as presenting a low risk of re-offending or of causing serious harm but the offence was of relatively high seriousness then the appropriate requirements are likely to be primarily punitive. 6.32 An intensive supervision and surveillance requirement and a fostering requirement are both community alternatives to custody. 6.33 The offence must be punishable by imprisonment, cross the custody threshold and a custodial sentence must be merited before one of these requirements can be imposed. 6.34 An order of this nature may only be imposed on a child or young person aged below 15 (at the time of the finding of guilt) if they are a persistent offender. 6.35 An order of this nature must include an extended activity requirement of between 90 and 180 days, a supervision requirement and a curfew requirement. Where appropriate, a YRO with intensive supervision and surveillance may also include additional requirements (other than a fostering requirement), although the order as a whole must comply with the obligation that the requirements must be those most suitable for the child or young person and that any restrictions on liberty are commensurate with the seriousness of the offence. 6.36 When imposing such an order, the court must ensure that the requirements are not so onerous as to make the likelihood of breach almost inevitable. 6.37 Where a fostering requirement is included within a YRO, it will require the child or young person to reside with a local authority foster parent for a specified period that must not exceed 12 months. 6.38 In order to impose this requirement the court must be satisfied that the behaviour which constituted the offence was due to a significant extent to the circumstances in which the child or young person was living, and that the imposition of fostering requirement would assist in the child or young person’s rehabilitation. It is likely that other rights will be engaged (such as those under Article 8 of the European Convention on Human Rights)32 and any interference with such rights must be proportionate. 6.39 The court must consult the child or young person’s parent or guardian (unless impracticable) and the local authority before including this requirement. It can only be included if the child or young person was legally represented in court when consideration was being given to imposing such a requirement unless the child or young person, having had the opportunity to do so, did not apply for representation or that right was withdrawn because of the child or young person’s conduct. This requirement may be included only where the court has been notified that arrangements are available in the area of the relevant authority. 6.40 A YRO with a fostering requirement must include a supervision requirement and can include other requirements when appropriate (except an intensive supervision and surveillance requirement). The order as a whole must comply with the obligation that the requirements must be those most suitable for the child or young person and that any restrictions on liberty are commensurate with the seriousness of the offence. 6.41 It is unlikely that the statutory criteria33 will be met in many cases; where they are met and the court is considering making an order, care should be taken to ensure that there is a well developed plan for the care and support of the child or young person throughout the period of the order and following conclusion of the order. The court will need to be provided with sufficient information, including proposals for education and training during the order and plans for the child or young person on completion of the order. A custodial sentence should always be used as a last resort. If offence specific guidelines for children and young people are available then the court should consult them in the first instance to asses whether custody is the most appropriate disposal. 6.42 Under both domestic and international law, a custodial sentence must only be imposed as a ‘measure of last resort;’ statute provides that such a sentence may be imposed only where an offence is “so serious that neither a fine alone nor a community sentence can be justified.”34 If a custodial sentence is imposed, a court must state its reasons for being satisfied that the offence is so serious that no other sanction would be appropriate and, in particular, why a YRO with intensive supervision and surveillance or fostering could not be justified. 6.43 The term of a custodial sentence must be the shortest commensurate with the seriousness of the offence; any case that warrants a DTO of less than four months must result in a non‑custodial sentence. The court should take account of the circumstances, age and maturity of the child or young person. 6.44 In determining whether an offence has crossed the custody threshold the court will need to assess the seriousness of the offence, in particular the level of harm that was caused, or was likely to have been caused, by the offence. The risk of serious harm in the future must also be assessed. The pre-sentence report will assess this criterion and must be considered before a custodial sentence is imposed. A custodial sentence is most likely to be unavoidable where it is necessary to protect the public from serious harm. 6.45 Only if the court is satisfied that the offence crosses the custody threshold, and that no other sentence is appropriate, the court may, as a preliminary consideration, consult the equivalent adult guideline in order to decide upon the appropriate length of the sentence. 6.46 When considering the relevant adult guideline, the court may feel it appropriate to apply a sentence broadly within the region of half to two thirds of the adult sentence for those aged 15 – 17 and allow a greater reduction for those aged under 15. This is only a rough guide and must not be applied mechanistically. In most cases when considering the appropriate reduction from the adult sentence the emotional and developmental age and maturity of the child or young person is of at least equal importance as their chronological age. 6.47 The individual factors relating to the offence and the child or young person are of the greatest importance and may present good reason to impose a sentence outside of this range. The court should bear in mind the negative effects a short custodial sentence can have; short sentences disrupt education and/or training and family relationships and support which are crucial stabilising factors to prevent re-offending. 6.48 There is an expectation that custodial sentences will be particularly rare for a child or young person aged 14 or under. If custody is imposed, it should be for a shorter length of time than that which a young person aged 15 – 17 would receive if found guilty of the same offence. For a child or young person aged 14 or under the sentence should normally be imposed in a youth court (except in cases of homicide or when the dangerous offender criteria are met). 6.49 The welfare of the child or young person must be considered when imposing any sentence but is especially important when a custodial sentence is being considered. A custodial sentence could have a significant effect on the prospects and opportunities of the child or young person and a child or young person is likely to be more susceptible than an adult to the contaminating influences that can be expected within a custodial setting. There is a high reconviction rate for children and young people that have had custodial sentences and there have been many studies profiling the effect on vulnerable children and young people, particularly the risk of self harm and suicide and so it is of utmost importance that custody is a last resort. 6.50 A court can only impose a DTO if the child or young person is legally represented unless they have refused to apply for legal aid or it has been withdrawn as a result of their conduct. 6.51 If it is determined that the offence is of such seriousness that a custodial sentence is unavoidable then the length of this sentence must be considered on an individual basis. The court must take into account the chronological age of the child or young person, as well as their maturity, emotional and developmental age and other relevant factors, such as their mental health or any learning disabilities. 6.53 A DTO can be made only for the periods prescribed – 4, 6, 8, 10, 12, 18 or 24 months. Any time spent on remand in custody or on bail subject to a qualifying curfew condition should be taken into account when calculating the length of the order. The accepted approach is to double the time spent on remand before deciding the appropriate period of detention, in order to ensure that the regime is in line with that applied to adult offenders.35 After doubling the time spent on remand the court should then adopt the nearest prescribed period available for a DTO. 6.54 A child or young person may be sentenced by the Crown Court to long-term detention under section 91 of the Powers of Criminal Courts (Sentencing) Act 2000 if found guilty of a grave crime and neither a community order nor a DTO is suitable. 6.55 These cases may be sent for trial to the Crown Court or committed for sentence only36 (see section two for further information). 6.56 It is possible that, following a guilty plea, a two year detention order may be appropriate as opposed to a sentence of section 91 detention, to account for the reduction. 6.57 If a child or young person is found to be a dangerous offender they can be sentenced to extended detention or detention for life. 6.58 A sentence of extended detention may be imposed only where the appropriate custodial term would be 4 years or more. The extension period must not exceed 5 years in the case of a specified violent offence and 8 years in the case of a specified sexual offence. The term of the extended sentence of detention must not exceed the maximum term of imprisonment for an adult offender convicted of that offence. The court is required to set a minimum term which must be served in custody before parole can be considered. 6.60 This is the mandatory sentence for any child or young person found guilty of committing a murder. The starting point for the minimum term is 12 years. 7.1 If a child or young person commits an offence during the period of conditional discharge then the court has the power to re-sentence the original offence. The child or young person should be dealt with on the basis of their current age and not the age at the time of the finding of guilt and the court can deal with the original offence(s) in any way which it could have if the child or young person had just been found guilty. 7.2 There is no requirement to re-sentence; if a court deems it appropriate to do so they can sentence the child or young person for the new offence and leave the conditional discharge in place. If the order was made by the Crown Court then the youth court can commit the child or young person in custody or release them on bail until they can be brought or appear before the Crown Court. The court shall also send to the Crown Court a memorandum of conviction. 7.3 If the offender is convicted of committing a new offence after attaining the age of 18 but during the period of a conditional discharge made by a youth court then they may be re-sentenced for the original offence by the convicting adult magistrates’ court. If the adult magistrates’ court decides to take no action then the youth court that imposed the conditional discharge may summon the offender for the breach to be dealt with. revoke the order and re-sentence the child or young person in any way which they could have been dealt with for that offence. If re-sentencing the child or young person the court must take into account the extent to which the child or young person has complied with the requirements of this order. 7.5 If the order was made by the Crown Court then the youth court can commit the child or young person in custody or release them on bail until they can be brought or appear before the Crown Court. 7.6 The child or young person or a Youth Offending Team (YOT) officer can also apply for the order to be revoked or amended but any new provisions must be ones that the court would have been able to include when the original reparation order was given. There is no power to re‑sentence in this situation as the child or young person has not been found to be in breach of requirements. Even when an offender has attained the age of 18 breach of a reparation order must be dealt with in the youth court. impose a fine up to a maximum of £2,500. 7.8 If an offender has attained the age of 18 by the first court hearing then breach proceedings must be dealt with by the adult magistrates’ court. If the court chooses to revoke the order then its powers are limited to those available to the court at the time of the original sentence. 7.9 The court has the power to extend a referral order in respect of additional or further offences. This applies to not only a first referral order but also to any subsequent referral orders. Any period of extension must not exceed the total 12 month limit for a referral order. 7.10 If the court chooses not to extend the existing referral order or impose a discharge they have the power to impose a new referral order (where the discretionary referral order conditions are satisfied) in respect of the new offences only. This order can remain or run alongside the new order or the court may direct that the contract under the new order is not to take effect until the earlier order is revoked or discharged. Alternatively, the court may impose an absolute or conditional discharge. 7.11 If the court sentences in any other way they have a discretionary power to revoke the referral order. Where an order is revoked, if it appears to be in the interests of justice, the court may deal with the original offence(s) in any way that the original court could have done, but may not make a new referral order. Where the referral contract has taken effect, the court shall have regard to the extent of the child or young person’s compliance with the terms of the contract. revoke the order and re-sentence the child or young person. 7.13 If the terms of the order are amended the new requirements must be capable of being complied with before the expiry of the overall period. The court may impose any requirement that it could have imposed when making the order and this may be in addition to, or in substitution for, any requirements contained in the order. If the YRO did not contain an unpaid work requirement and the court includes such a requirement using this power, the minimum period of unpaid work is 20 hours; this will give greater flexibility when responding to less serious breaches or where there are significant other requirements to be complied with. 7.14 A court may not amend the terms of a YRO that did not include an extended activity requirement or a fostering requirement by inserting them at this stage; should these requirements be considered appropriate following breach, the child or young person must be re-sentenced and the original YRO revoked. 7.15 A court must ensure that it has sufficient information to enable it to understand why the order has been breached and should be satisfied that the YOT and other local authority services have taken all steps necessary to ensure that the child or young person has been given appropriate opportunity and the support necessary for compliance. This is particularly important if the court is considering imposing a custodial sentence as a result of the breach. 7.16 Where the failure arises primarily from non-compliance with reporting or other similar obligations and a sanction is necessary, the most appropriate response is likely to be the inclusion of (or increase in) a primarily punitive requirement such as the curfew requirement, unpaid work, the exclusion requirement and the prohibited activity requirement or the imposition of a fine. However, continuing failure to comply with the order is likely to lead to revocation of the order and re-sentencing for the original offence. 7.17 Where the child or young person has ‘wilfully and persistently’ failed to comply with the order, and the court proposes to sentence again for the offence(s) in respect of which the order was made, additional powers are available. A child or young person will almost certainly be considered to have ‘wilfully and persistently’ breached a YRO where there have been three breaches that have demonstrated a lack of willingness to comply with the order that have resulted in an appearance before court. the imposition of a DTO for four months for breach of a YRO with intensive supervision and surveillance which was imposed following wilful and persistent breach of an order made for a non-imprisonable offence. The primary objective when sentencing for breach of a YRO is to ensure that the child or young person completes the requirements imposed by the court. 7.19 If an offender has attained the age of 18 by the first court hearing then breach proceedings must be dealt with by the adult magistrates’ court. If the court chooses to revoke the order then its powers are limited to those available to the court at the time of the original sentence. 7.20 If a child or young person commits an offence whilst subject to a YRO the court can impose any sentence for the new matter, but can only impose a new YRO if they revoke the existing order. Where the court revokes the original order they may re-sentence that matter at the same time as sentencing the new offence. Even if the offender has attained the age of 18 proceedings for breach of the supervision requirements must be dealt with in the youth court. 7.22 If a child or young person is found guilty of a further imprisonable offence committed during the currency of the order then the court can impose a further period of detention. This period of detention cannot exceed the period between the date of the new offence and the date of when the original order would have expired. 7.23 This period can be served consecutively or concurrently with any sentence imposed for the new offence and this period should not be taken into account when determining the appropriate length of the sentence for the new offence. 1 This section does not apply when imposing a mandatory life sentence, when imposing a statutory minimum custodial sentence, when imposing detention for life under the dangerous offender provisions or when making certain orders under the Mental Health Act 1983. 21 In cases where (in accordance with the Criminal Procedure Rules) a child/young person is given the opportunity to enter a guilty plea without attending a court hearing, doing so within the required time limits will constitute a plea at the first stage of proceedings. 22 A Newton hearing is held when a child/young person pleads guilty but disputes the case as put forward by the prosecution and the dispute would make a difference to the sentence. The judge will normally hear evidence from witnesses to decide which version of the disputed facts to base the sentence on. 23 A special reasons hearing occurs when a child/young person is found guilty of an offence carrying a mandatory licence endorsement or disqualification from driving and seeks to persuade the court that there are extenuating circumstances relating to the offence that the court should take into account by reducing or avoiding endorsement or disqualification. This may involve calling witnesses to give evidence. 31 The examples provided here are not exclusive; the YOT will make recommendations based upon their assessment of the young offender which may vary from some of the examples given.